Ascension of Christ with God the Father, four adoring angels, the Virgin and the Apostles. 94,5 x 57,5 cm (37 1/8 × 22 5/8 in.). – Collection of Baron Petre, of Essex, probably 19th century (according to a crest in red sealing wax on the back). In 2015 this panel was cleaned in Florence by the conservator Stefano Scarpelli, and is in very good condition. The wood support, strengthened on the back by a rectangular insert, has retained its original form and only has a few insignificant cracks on the edges; the paint surface has only a very slight craquelure along its margins. Formerly owned by a British noble family, the Barons Petre of Writtle in Essex, whose red wax seal appears on the back of the panel, the painting subsequently passed to a Swiss private collection, until it was sold at the Galerie Fischer in Lucerne in an auction held on 26-30 June 1962. The painting, which has always borne a correct attribution to Neri di Bicci, is a focused representation of the Ascension, the last event of the Jesus’ earthly life, which took place forty days after his Resurrection. Apart from this work, we know of only one other treatment of the subject by the painter; neither of them registered in the Ricordanze, his celebrated workshop journal for the years 1453-1475, but they must in any case have been painted on either side of that twenty-two year period. The style of the Triptych of the Ascension, Four Saints and the Annunciation – an altarpiece with a provenance from the Monastery of Santa Maria degli Angeli in Florence, and displayed since April 2015 in the Uffizi Gallery – is still indebted to the teachings of his father, Bicci di Lorenzo, and is datable to about 1440. With respect to Neri’s first version of the subject, the Sarti Ascension revisits his earlier composition, placing the Apostles and the Virgin in a circle around a rocky outcrop, at the top of which (in both paintings) the painter carefully describes the footprints left by Christ after he has begun his ascent to Heaven, where he will physically join his Father. The blatant, energetic style that marks this composition is typical of Neri di Bicci’s late period, during the later 1470s, as is evident from a comparison with the Coronation of the Virgin with four Angels and Saints Augustine, Paul, John the Baptist, Peter, Mary Magdalene and Roch (San Casciano Val di Pesa, Museo di Arte Sacra), commissioned in 1476 by Giraldo dei Giandonati for the church of San Giovanni in Sugana, and completed by the master in 1481. The quizzical, coarse description of the figures is identical: earthy faces with rosy, almost feverish cheeks, marked by deep furrows and long nasal shafts that accentuate their snub noses. Typical of this period is the way the eyes are cut into the faces, deepening the figures’ gazes, and the emphatically graphic quality of beards and hair. The winsomely ironic, wry beginning of a smile of the Redeemer in the Tuscan painting, or the corresponding look in the more or less contemporary Coronation of the Virgin with Angels and four Saints in the Walters Art Museum, Baltimore, now yields to a more melancholy, silent, unaccented and measured expression, found in the other main figures in our painting. The insistent, repeated facial features and gestures, in some passages simply replicated, as in the two Apostles on the left side of our composition, covering their heads with their hands, or in certain profiles, is only partly compensated by the deliciously enamelled, luminous brushwork of the paint surface; a straightforward comparison can be made with the more summary handling usually found in the painted bases of altarpieces. Even the idea of an atmospheric sky that is so cool and crystalline, in clear contrast with the bare landscape below, had already been used by the master in some of his predella scenes,8 and it recurs in the contoured panel with the Virgin, Saint John the Evangelist and Mary Magdalene (Toulouse, Musée des Augustins) made to complete an image of the Crucified Christ painted by Lorenzo Monaco. In conclusion, we may note the rather unusual minimalist depiction of the little cherubim surrounding the golden sphere at the top, since these are customarily shown in a more realistic and detailed way. The same stylised angelic beings, painted in monochrome, appear in very few works, usually placed marginally with respect to the main, more atmospheric composition in an altarpiece. A parallel for our painting, from the same period, is found in the little vermilion heads of the seraphim in the upper left corner of the splendid Annunciation (Tavarnelle Val di Pesa, Santa Lucia al Borghetto) painted in 1471 by Neri for Gherardino di Nicolò Bertini, treasurer of the Compagnia dell’Annunziata in San Francesco, Barberino Valdelsa. Such a feature was probably included to satisfy the requirements of the patron or purchaser. 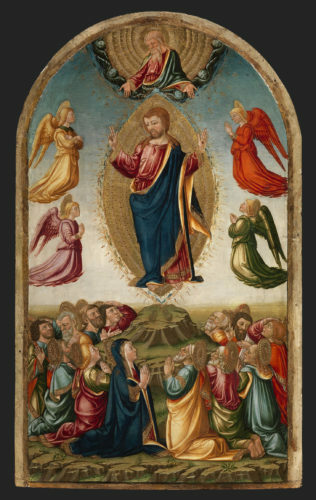 This Ascension is a fine work painted by Neri di Bicci towards the end of the 1470s, in tune with what he and his workshop were crafting in these years. Notwithstanding the presence of well-established forms and models that characterized his late period, the overall impression is that he was tentatively studying the most contemporary Florentine language, yet never detaching himself from traditional genres. He ultimately achieved his own idiosyncratic and indeed whimsical goals.